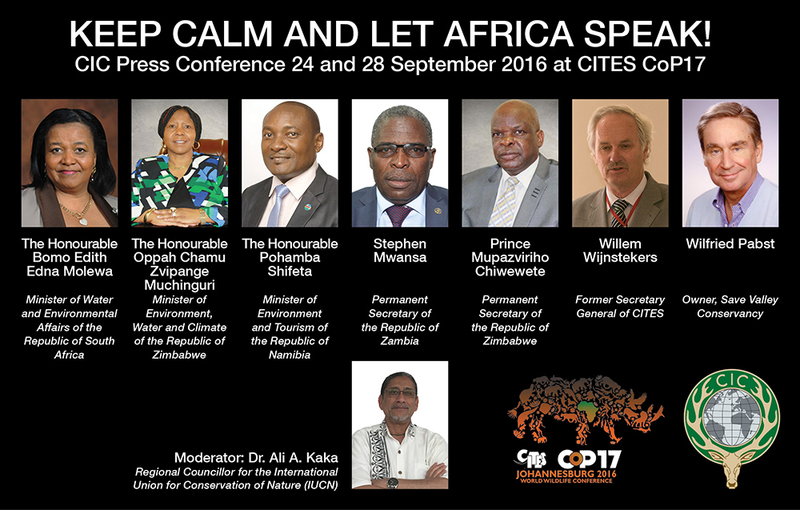 The International Council for Game and Wildlife Conservation, CIC, sponsored two high-level panel discussions and press conferences on 24th and 28th September during the 17th Conference of the Parties of CITES. Initially CIC planned only one press conference, but due to demand by the Africa Ministers present in the first meeting and the interest generated, a second event was scheduled. Three African environment portfolio ministers, The Honorable Edith Edna Molewa, Minister of Water and Environmental Affairs (South Africa), The Honorable Pohamba Shifeta, Minister of Environment and Tourism (Namibia), and The Honorable Oppah Chamu Zvipane Muchinguri, Stephen Mwansa, Permanent Secretary Ministry of Tourism & Arts (Zambia), Prince Mupazviriho Chiwewete, Permanent Secretary Ministry of Environment Water and Climate (Zimbabwe), Shonisani Munzhedzi, Deputy Director-General: Biodiversity and Conservation of the Department of Environmental Affairs (South Africa), Willem Wijnstekers, former Secretary General of CITES and Deputy President Division Policy & Law of the CIC International Council for Game and Wildlife Conservation (The Netherlands) and Wilfried Pabst, owner of Sango Conservancy & Lodge within Savé Valley Conservancy (Zimbabwe) formed an impressive panel. 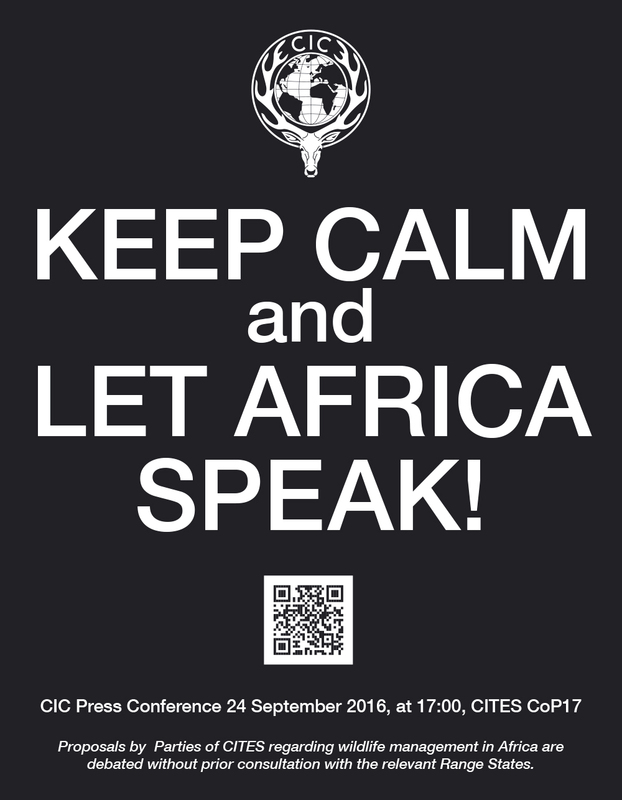 With ingrained authority the panelists addressed the topic “Keep Calm and Let Africa Speak” and took questions and comments from around 100 guests and journalists from around the world in the two meetings. The discussions and interactions with the plenum was moderated with distinction by Dr. Ali A. Kaka, Africa Regional Councilor for the International Union for Conservation of Nature (IUCN). The participating journalists packed the press room to hear firsthand the views of the African representatives on the proposals being submitted to and discussed at COP 17. It soon became clear that the panelists considered many of the proposals to be primarily driven either by African States with very poor conservation results or by non-African states which have little or no wildlife of relevance to the proposals up for decision by the voting delegates at CITES. Clearly aggrieved at many suggestions on which they were not consulted as range nations, and/or on which their views based on successful conservation models were not taken with the seriousness they deserved the panelists did not mince words and spoke candidly. The audience was accorded ample time to ask questions and make observations. Keen observers noted that there was widespread support for the sentiments of the panelists. Questions at some of the panelists on the status of their wildlife and on some incidents that intended to cast a shadow on the national wildlife management strategies of the participating countries were answered with resounding arguments. In his opening remarks Dr. Ali Kaka got right to the point saying “We are talking about the sustainable use of wildlife”. “We’re being told by people outside, by people my color of skin, how to run things in Africa,” Wilfried Pabst, owner of the Sango Conservancy in Zimbabwe, said. He highlighted that the call for a ban earlier this year by some European Union parliamentarians on the importation of trophies was equivalent to banning hunting. “They have neither regard nor understanding of what they are effectively destroying. In southern Africa alone, if we ban sustainable use, we would eliminate some 55 million hectares of land under conservation and lose in the region of 20 million animals, hundreds of thousands of jobs, each man or woman supporting a family of 10, thus putting millions of local people into destitution,” Pabst passionately explained. “Sustainable use is a “very successful conservation model”, he said. “None of these NGO’s would like to see an intact and growing Wildlife scene. Why? If Wildlife is well conserved as in southern Africa at large, these NGO’s could not raise any funds, their business model would die, their offices, vehicles overseas trips would disappear. Conclusion? These NGO’s can only survive or thrive by leaving donors in the dark as to the real effect of their donations and they need chaos and destitution in wildlife conservation to solicit these funds. That is indeed a criminal business model,” Pabst concluded. “Sustainable use, conservation and fair equitable benefit sharing are the pillars of the natural resources! There is no way that we would have sustainable conservation without looking at the issues affecting people, ” Munzhedzi concluded. The CIC International Council for Game and Wildlife Conservation is a politically independent and globally active advocacy working in the public interest with a diverse membership that includes states, corporates, universities and associations. The core strength of the CIC rests in dedicated hunter-conservationist members from all continents. CIC advocates wildlife conservation across diverse landscapes through shared incentive-driven use. Our adaptive management approach is grounded in cutting-edge science. CIC values traditional knowledge reflected in millennia of diverse hunting heritage. The members uphold and evolve the fundamentals of ethical hunting. CIC aims that each generation bequeaths to its successor intact landscapes richer in wildlife. The CIC CITES Team consisted of Heli Siitari, President of CIC Division Policy and Law, Willem Wijnstekers, former CITES Secretary General & Deputy President of CIC Division Policy and Law, Willy Pabst, CIC member and conservancy owner in Zimbabwe, Tamás Marghescu, CIC Director General.